We report the case of a 57-year-old male who presented with recurrent sinus infections and frequent nasal irrigation. He was found at nasal endoscopy to have multiple outgrowths along his ethmoid and maxillary sinuses. Computed tomography (CT) showed multiple bony exostoses along these sinuses. We report the imaging findings of exostoses associated with sinonasal irrigation. Chronic local irritation, most frequently from prolonged or repeated exposure of ear canals to water, is known to cause exostoses of the external auditory canal . This process is thought to be related to cold water exposure , although in patients exposed to warmer water temperatures exostoses may also develop but generally after a longer period of exposure [1, 3]. The length of cold water exposure is also associated with increasing severity of exostoses . Exostoses in the paranasal sinuses have been reported several times in the otolaryngology literature, but have not been described in the radiology literature to our knowledge [5-7]. The objective of this paper is to describe the CT features of this unusual entity, presumably related to chronic sinonasal irrigation. A 57-year-old male presented with a lifelong history of recurrent sinus infections. He had undergone two sinus surgeries, 11 and 20 years prior, reportedly for nasal polyposis, and was maintained on a course of saline irrigation and itraconazole irrigations for at least 7 years. He continued to experience one to two sinus infections per year, which were treated with antibiotics. 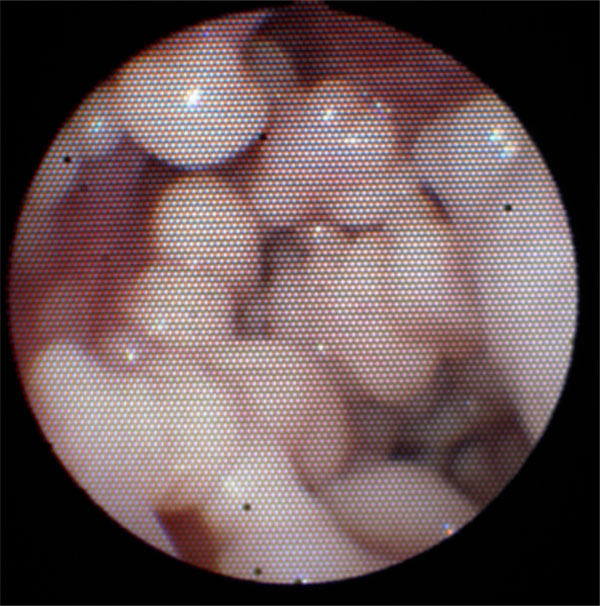 On intranasal exam and nasal endoscopy, there were multiple outgrowths along the residual ethmoid sinus septae and a cobblestone appearance to the sinus mucosa of the maxillary sinuses (Fig. 1). No frank polyps or purulence was seen. The patient was referred for CT of the paranasal sinuses for further evaluation. Noncontrast sinus CT showed multiple bony exostoses in the regions of visible abnormality at endoscopy (Fig. 2). Some similar bony overgrowths had been present on a sinus CT from another institution performed six years prior, but there had been significant progression in the number and size of the lesions over the imaging interval (not shown). Image taking during nasal endoscopy demonstrates the numerous exostoses seen along the residual ethmoid sinuses. 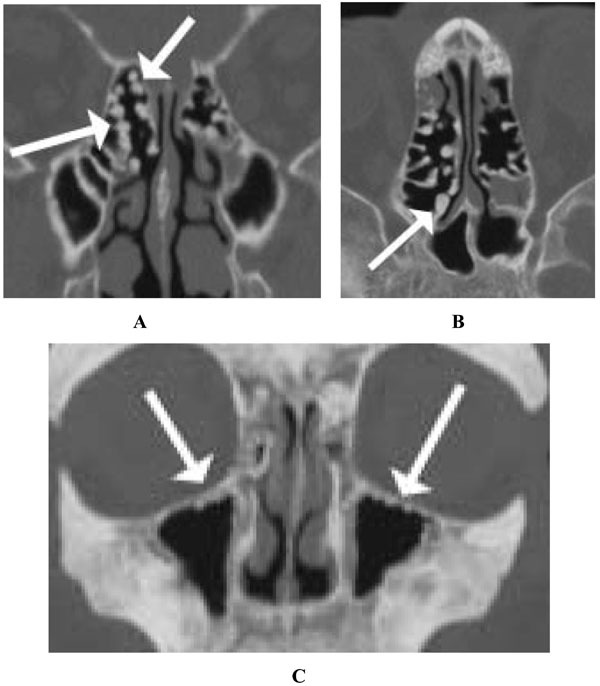 Bone algorithm sinus CT without contrast demonstrates multiple bony exostoses arising from the cut ends of the ethmoid septae and the sinus walls (A, coronal and B, axial) and multiple tiny exostoses along the superior maxillary sinus walls (C, coronal). In this patient, frequent nasal irrigation presumably led or at least contributed to development of multiple bony exostoses in the paranasal sinuses. In the EAC, bone formation is thought to result from repeated stimulation of the periosteum by cold water without subcutaneous fat for insulation . Exostoses in the paranasal sinuses presumably develop by the same mechanism. These exostoses appear as multifocal bony overgrowths on CT, in this case most abundant along the operated margins of the ethmoid sinuses, but also within the maxillary sinuses. These exostoses differ from paranasal osteomas, which are common, typically solitary benign tumors of the paranasal sinuses most frequently occurring in the frontal sinus . Osteomas are most commonly asymptomatic but may be associated with recurrent facial pain or headache, particularly if they cause sinus obstruction. Our patient did not have any symptoms clearly attributable to the exostoses. These exostoses also differ from osteitis where the sinus walls show diffuse, smooth remodeling and thickening on CT. The development of paranasal exostoses has been reported in patients with previous surgery, and it is unknown if these exostoses can also develop in patients without prior paranasal sinus surgery. In the prior reports, the majority of patients admitted to using cold irrigation solutions, although in one patient the irrigants may have been room temperature . Interestingly, our patient claimed that the majority of the time he used room temperature irrigants. Although the published experience with this entity remains limited, the length of exposure to irrigants, temperature of the irrigation solutions, and presence of prior paranasal sinus surgery may all be relevant for development of this process. Continued clinical and imaging follow-up of this patient will be helpful to determine the natural history of these exostoses. DiBartolomeo JR. Exostoses of the external auditory canal Ann Otol Rhinol Laryngol 1979; 88(Suppl 61 ): 2-20. Fowler EP, Osmun PM. New bone growth due to cold water in the ears Arch Otolaryngol 1942; 36: 455-66. Deleyiannis FW-B, Cockcroft BD, Pinczower EF. Exostoses of the external auditory canal in Oregon surfers Am J Otolaryngol 1996; 17: 303-7. Wong BJF, Cervantes W, Doyle KJ, et al. Prevalence of external auditory canal exostoses in surfers Arch Otolaryngol Head Neck Surg 1999; 125: 69-72. Ramakrishnan JB, Pirron JA, Perepletchikov A, Ferguson BJ. Exostoses of the Paranasal sinuses Laryngoscope 2010; 120: 2532-4. Haffey T, Woodard T, Sindwani R. Paranasal sinus exostoses: An unusal complication of topical drug delivery using cold nasal irrigations Laryngoscope [Epub ahead of print] [Epub ahead of print] 2012. Adelson RT, Kennedy DW. Paranasal sinus exostoses: Possible correlation with cold temperature nasal irrigation after endoscopic sinus surgery Laryngoscope [Epub ahead of print] 2012. Buyuklu F, Akdogan MV, Ozer C, Cakmak O. Growth characterisitics and clinical manifestations of the paranasal sinus osteomas Otolaryngol Head Neck Surg 2011; 145: 319-23.